The 6.7 L Cummins turbodiesel is the largest in-line 6 cylinder engine offered in the light-duty truck market. The Cummins engine is developed in Columbus, Indiana with the specific Dodge Ram needs in mind. This engine is used in Dodge Ram 2500 and 3500 trucks. These trucks basically come with the option of a light-duty pickup truck, as would be common for most regular users, or it can also be purchased as a cab-chassis, which would be common for commercial applications or work trucks. The 6.7L Cummins was first introduced in the middle of 2007 and served as a replacement for the 5.9L Cummins diesel. As with GM and Ford, the main competitors for Dodge in the light-duty diesel market, stricter emissions regulations was one of the primary factors in the introduction of the new engine model. 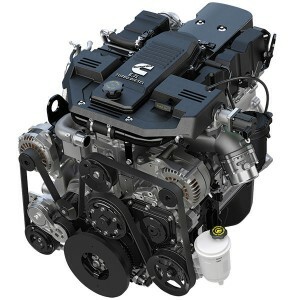 For Cummins, however, it is likely that a new engine model would be coming soon anyway, as the 5.9L had been in production for many years, and this new engine was needed to take advantage of new and improved technologies. This engine is still in production today, although many changes have taken place since its inception. One of the primary changes was related to the aftertreatment technologies. With the introduction of this engine, the exhaust was equipped with a diesel particulate filter (DPF) which served to trap soot until the DPF becomes full, and it is then cleaned by a special operating mode which increases temperatures to greater than 600 degrees Celcius. In 2010 selective catalytic reduction (SCR) was added for cab chassis models, and then in 2013 the SCR was also added for the remaining Cummins 6.7L offerings. This added the requirement of Diesel Exhaust Fluid filling for owners. Cummins has another solid engine in this 6.7L offering with plenty of performance for most applications while also providing the reliability that customer’s desire. As Cummins offers several iterations of this engine in Dodge Ram trucks, the power and torque also vary greatly based on the specific application. The primary differentiator in these power offerings is the transmission selected to be coupled with this engine. With the initial offering in 2007, the maximum horsepower was 350 at just over 3000 RPM, with peak torque being 650 lb-ft at 1500 RPM for the automatic transmission and 610 lb-ft at the same RPM for manual transmission applications. For 2015 the highest power offering comes in combination with the Aisin transmission which puts out 385 horsepower at 2800 RPM and 865 lb-ft of torque at 1700 RPM. This 6.7L, or 408 cubic inch for those that prefer standard units, is designed with a bore of 4.21 inches and a stroke of 4.88 inches. This engines also uses a variable geometry turbocharger (VGT) technology is also used as an exhaust brake to help save your brakes when carrying large loads down steep grades. The fuel injection system is Bosch common rail with a maximum injection pressure of 26,000 psi. This engine is constructed of cast iron block and head, which some of its competitors have now moved away from. It uses overhead valve (OHV) with 4 valves per cylinder. The valve opening and closing are driven using a solid lifter camshaft. The 6.7L Cummins is a reliable engine with plenty of power to get the job done. This engine has been in production since 2007, but has made many upgrades over time that allow it to stay competitive with some of the newer engines offered by other light duty diesel applications. Cummins has been a mainstay for Dodge Ram trucks and a primary reason for buying Dodge Ram for many Cummins enthusiasts.